Dry embossing is yet another easy technique for you to achieve on your cards and the results can be really amazing. This effect is created by making an impression into the card with a ball tool, as opposed to raising the image with embossing powders as is done with heat embossing. Look around and you will see that there are many examples of the technique in every day objects. 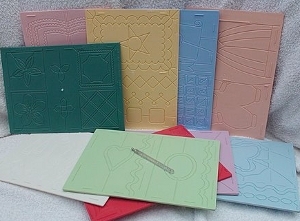 It can be done using a stencil and an embossing tool to create the indent into the card or paper. Brass stencils are used for just such a technique and there are many pretty ones on the market. It can also be done free hand or with the aid of a light box, which allows the image to show through the paper that you wish to emboss. My chosen method is to use boards especially made for the job. There is no mess, you don't need a power source and they are easy to use. With these boards you will need a large ball tool, and the boards are designed with channels that the ball tool will slot into to give you the effect you want. You work on the wrong side of the card, and because card can dry out when it is stored, you will need to slick the surface. You can see some of the designs on the boards and they are double sided so each one comes with many shapes. For instance the Christmas board has frames, candles and baubles that you can put directly to your card or add seperatlyonto another panel that is to be added to the card.